Author Jim Griffith’s Newly Released “The Adventures of Baby Norman: Christmas at the Clarksdale Estate” is the Christmas Adventure of Norman the Dog. “The Adventures of Baby Norman: Christmas at the Clarksdale Estate” from Christian Faith Publishing author Jim Griffith is the tale of Norman the dog and his Christmas adventure. After a mischievous plan to meet with Santa goes wrong, Norman find himself in an adventure he could only dream about. “The Adventures of Baby Norman: Christmas at the Clarksdale Estate”: Norman the dog’s big Christmas adventure. “The Adventures of Baby Norman: Christmas at the Clarksdale Estate” is the creation of published author, Jim Griffith. James was born the youngest of five siblings in New York City and lived there until the age of seven. His parents moved him upstate where he attended Shaker High School. He excelled in sports and music, but found he had a gift for the written word. He went on to study at HVCC where he received an associate degree in Science with a minor in Literature. He was accepted into Siena College, but declined the admissions offer because he wanted to continue his true passion: writing novels. Published by Christian Faith Publishing, Jim Griffith’s new book a Christmas adventure. It is the night before Christmas. Norman, a silly dog, and his brother Oliver have devised a scheme to see Santa when he arrives. Their plan is to get to the observation deck on the top of the roof. It is, after all, the best place to view the entire estate, especially the night sky. The two manage to make their way up to the roof where Norman slips and slides off the side of the building. Landing headfirst in a snowbank., Norman falls into a coma. As the family vet does everything he can to save the lovable pup, Norman dreams away. More than just a simple dream, it quickly becomes an adventure Norman could only dream about. 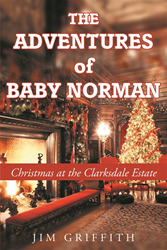 View a synopsis of “The Adventures of Baby Norman: Christmas at the Clarksdale Estate” on YouTube. Consumers can purchase“The Adventures of Baby Norman: Christmas at the Clarksdale Estate” at traditional brick & mortar bookstores, or online at Amazon.com, Apple iTunes store, Kobo or Barnes and Noble. For additional information or inquiries about “The Adventures of Baby Norman: Christmas at the Clarksdale Estate”, contact the Christian Faith Publishing media department at 866-554-0919.